The UKIP Save The Pubs campaign began its London & The South East leg in earnest on Bank Holiday Monday May 4th with campaigner Nick Hogan and UKIP London Chairman Paul Wiffen touring pubs in the Bromley and Westerham area. This was to pave the way for Nick Hogan to address a public meeting today, Tuesday May 5th, at Trinity United Reform Church in Bromley at 7.30pm along with Steve Harris, UKIP MEP candidate for the South East in the forthcoming June 4th Euro Elections (along with UKIP Leader Nigel Farage and EU Whistleblower Marta Andreasen). Nick Hogan is the landlord of the Swan With Two Necks in Chorley near Bolton who was fined £11,500 for refusing to send three Second World War veterans out into the rain to smoke. He has been pursued unrelentingly through the courts in the North-West for his refusal to implement the smoking ban and has lost several of his pubs as a result. He now spearheads UKIP’s campaign to “let the landlord decide” on a whole range of issues including smoking, live music & karaoke. He will stand for UKIP in Chorley in the June 4th elections. 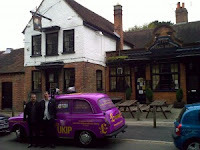 On Tuesday May 5th, Hogan & Wiffen are joined by sitting London MEP Gerard Batten & MEP candidate Lawrence Webb touring the pubs in East London’s Havering & Redbridge boroughs in the UKIP-liveried London Campaign Taxi (see attached pic), ahead of its early morning appearance at the Stratford protest over the French company Bougyes employing Portuguese workers to build the Olympics Village on May 6th. Its Ripped off, Out of Work and Ignored slogans should really resonate with the workers protesting yet another travesty of EU labour being used to undercut costs on public money projects at the Stratford site. Later that morning (May 6th) the four of them will tour the pubs in Westminster & The City in the UKIP Taxi talking to landlords. They will then snare politicians at the Westminster Arms off Parliament Square at lunchtime to protest the increase in beer tax brought in by Chancellor Alistair Darling in the recent budget, instead of “Axing The Tax” as UKIP have been demanding (33% of the price of a pint is taken by The Exchequer). Catch the UKIP Cab outside the Westminster Arms at lunchtime on Wed 6th May. Nick Hogan’s campaign to Save Our Pubs continues nationwide right up until the June 4th elections and beyond!